Add Voicemail capabilities so you can check your voicemail from within the app. - Travel worry-free with cheap calling so you never have to deal with expensive carrier plans or surprise bills. - You can make calls over Wi-Fi from anywhere in the world to any US number for free. - Free Plan includes 200 minutes, 500 texts, and 500MB of data. Here is The New Tips and Tricks Dated "2/8/2017"
To get to the main settings-Click the 3 horizontal blue bars-top left side when you open the messaging app. Pop up from the side will open. To get to the phone setting-Click on the phone icon, and when you see the keypad-click settings again--than phone settings...Only on certain phone, some you have to go into settings. Freedompop use the Freedompop Messaging app to integrate the Phone's native dialer to place calls and receive calls. It is also used to create Text instead of using the Phones native messaging app. The only way to make phone call on a BYOD phone (Bring You Own Device) & Freedompop Branded Phones, the app has to be installed. Make sure the App is 100% updated. Once it is downloaded or updated. Open the app and place one call using the dial pad, top right corner of the app. This will initialize the phone for first use. You might even see the app syncing. It will sync in the notification area till you see your phone number. The screen might even turn blue for an instant with a Freedompop Logo. This is normal. It is just the app initializing. After you initialize, and the phone syncs, you can use the phone's native dialer for Phone calls. To make a text or receive text, you will use the Freedompop Messaging app. The app will ask you if you want to make Freedompop the default. Make sure to press yes. If you still have quality issues, sometimes messing with the Codec Bitrate Limit. Start with 36 kbits/s. If that don’t work, work your way up to 128 kbits/s. But only use this if the first suggestion does not work. 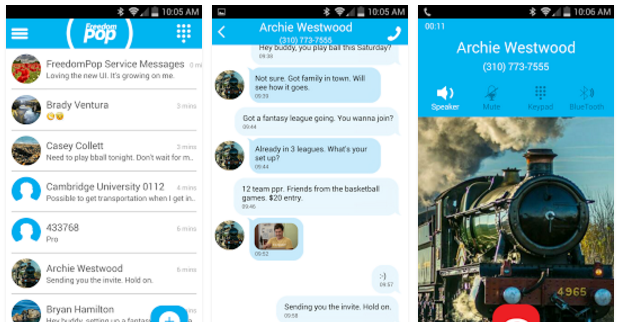 Open up your Freedompop Messaging App. Look for the 3 white horizontal bars, top left side of the app. Please click those lines. You will see a pop out from the side, with your number and account information. Scroll down to Sync Account Data and Tap. You might even see the app syncing. It will sync in the notification area till you see your phone number. The screen might even turn blue for an instant with a Freedompop Logo. This is normal. It is just the app Syncing. Do this as soon as you switch from the current signal to the next signal and see if it makes a difference. and awhile. I like to do mine once a day. Will give any FreedomPop app a Fresh Start. Open up settings on your phone and scroll down. Find Apps and open. Look for the FreedomPop Messaging app (white and blue icon that says Messaging) and open. Click Force Stop and then Clear Cache. (Not Clear Data). Once you click Force Stop, you will get a pop up (if you force stop in may misbehave). Just click OK. Note: Make sure not to click, Clear Data that will erase all your text messages. Note: On Samsung Phones after you click Settings, Find the “More or 4th tab over”, top right corner and than Scroll down to find “Application/Application Management” . On your phone open up "Setting", Scroll down till you see "System Update". Open and click "Update Profile". Wait for the phone to update. The phone might restart. Go back to "Settings" and scroll down to "System Update" and open. Find "Update PRL". Wait for the phone to update. The phone might restart. This is a must when you have any type of connection issues. Note: Make sure you are connected to WiFi and you have a Good Sprint Signal to. I like to do mine outdoors or near a window with no obstructions. Note: Some Androids, you will find System Update in ("About Setting"). Note: Users with a GSM Phone or Sim, UK/ES/US/MX, will not find the Update Profile and PRL Settings. It is recommended to make sure the phone is Updated Only in System Updates. "you are not allowed to send text messages.msg 2120" from 9230. This seems to be an ongoing issue with Sprint servers. does this happen when your using the freedompop messaging app?? You just need to fine tune your setting depending on the phone. Reason for the post. I advise you to start a discussion or a question and see if maybe you can get a more detail answer. Its really funny, I tell allot of my fellow members to try this, and I get a few...That makes no sense, This has no connection to my freedompop messenger app. But it actually does. I don't know the technology behind this, but it works..With the 2 settings disabled...No incoming text. You still have outgoing and incoming calls and Outgoing text. But no incoming text. I understand how Data sync enabled works with the app, because it is a (APP/Application). Before we are told to disable this setting to save on battery life and data. But your Freedompop messaging app(update version 27/28), still need to sync in-order to receive updates(messages). I also think that somewhere in the code, it is also connected to the Play store. If the play store goes down, or I am logged out....No messages at all. At The Home page>>>Click Menu>>>Than Tick Settings>>>>Tick Accounts and Sync>>>>Make sure Background Data and Auto Sync are check marked....To save on data and battery, you can manually disable all apps below(manage accounts). Do not touch Google...Leave Google to sync. Same with The Freedompop messenger app and the Play store app. Go to the settings in your phone....Find and click Applications..Than Find and Click Manage Applications...Find the app(freedompop messenger) or (Play Store). Click the app in question.....Click Force Stop and Than Click Clear cache, not clear data. Go Back to the home screen and log back into the app. You no longer have to start up the application when you turn on the phone. It runs automatically. I tested it with both Text and Voice. It uses the native Dialer by default. So click the phone like you would if your not using an app. Most people are confused by the name, But the freedompop messaging app-Is both Text and Voice. If you decide to use the app to place a call, click compose-Then Contact(ok)-Then the phone receiver next to the name. Text, just click ok on the contact name. You can see how many voice minutes and text by--> In the freedompop message app...look at the top left hand side(messaging with a bluebox and a arrow point left) touch the arrow. Did I miss anything? Please feel free to add!!! Go to your account online and check your usage. If you have 500 mbs in your account when you started. You can only use 400 mbs. Freedompop will suspend your account at 100 mbs left. If you have Auto top off set to off. If you Have Auto Top of set to on...At 100mbs, you'll start to receive overages on your account..depends on what plan your on to know the prices. No mater the case...Check you account, if you having issues. Might be as simple as you went over your limit of Data, Voice or Text. Do you have any freedom friends? If you add 10 more friends, you have another 500mbs to help out...If you go to slick dealz/Facebook, they have around 700 emails..freedompopers waiting to be added. (no strings attached...you don't have to communicate or share data)..Just added there email and after they accept-50mbs each, up to 500 mbs..
always good to have a little more than 10. You get 500 mb ontop of the free 500mbs each month as long as all 10 stay active. Also, if you have never tried the App...MY FREDOOMPOP. (green box)...Download it from the Play store..open it up and log on with you freedompop account email and password,,,automatic 200mbs to use till the end of the month. You can use My freedompop to access you data, and all the normal stuff you can online. I figured because I had mentioned the freedom friends in my last comment. I'd explain the limitation of gifting mbs to your friends, and receiving Gift from your friends. You are limited to 500 mbs when sending gifts to your freedom friends.. So it good to have allot of freedom friends, sometimes you get lucky and receive extra data from one of the random friends. Maybe someday you can return the favor. Feel free to add me as a friend if you need any extra. anybody with some tips on configuring this app...there are a ton of settings for fine tuning? Hello again and Thanks for Reading.. Playing around with the phones I discovered another setting that may help with Lost Calls. I tried it on all three setting and found the setting that worked the best. when I ticked any of the other 2 options, I had calls drop in 3g and some calls never even made it to the phone. I tested the setting in 3g-4g & Wifi. I also used 3 phones to test it on. The Default setting for this is Available on Wifi...But when I used this setting, I got call on 4g and wifi perfect. But the phones dropped down to 3g-It was hit and miss. Wireless & networks or Battery & Data Manager > Delivery > Background data. Wow! More menu stuff hiding away under setting items. What will they think of next ? Yes, I had to use Google to find where it was hidden. Thanks again @djinks‌ I seen you say you have a few different phones...Can you do me a favor? maybe add here how to get to the settings mentioned above(on the phones settings menu), if there not already mentioned? Not sure what you referring too? The only phone settings I had trouble finding are mentioned above. I did find an S3 where Restrict Background Data is not displayed. I may have frozen some app on that device that prevents that option from displaying. Need to investigate. What other Phone (not app) settings do you want me to investigate?